As a mother, you know that baby's skin needs extra special care. 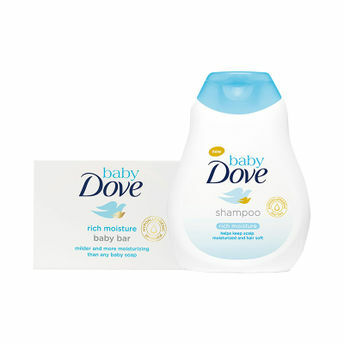 But did you know that after reverie bath, baby's skin can lose moisture upto 5 times faster than yours? That's why our Baby Dove Rich Moisture Shampoo helps replenish essential moisture and nutrients in the scalp as it gently cleanses. Its pH neutral formula retains the natural moisture of your baby's skin- leaving your baby's scalp visibly healthy, the hair soft and delicately scented.